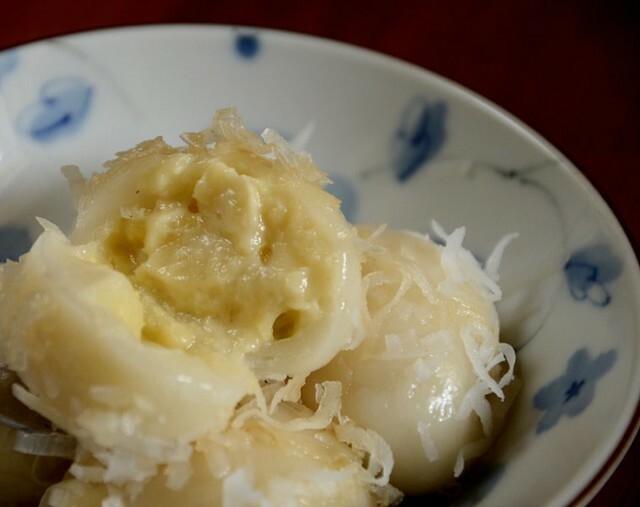 Durian mochi/tang yuan--sooner or later someone will come up with this or maybe someone already has but this is my version. I had a bit of leftover durian flesh and had no idea what to do with it. Then I saw a copy of Silkroad, the Dragonair inflight magazine that Yo had brought for me. The latest issue featured Hong Kong dessert houses and the new desserts, the most unusual one being a bitter gourd sherbet. Now that's a dessert I can't wait to try next time. It must be quite an eating experience! Instead of red bean or sesame paste, I filled my tang yuan (glutinous rice balls) with the lefttover mashed durian flesh, sprinkled some dessicated coconut (fresh shaved coconut would've been perfect but I was too lazy to run out for that) over and drizzled a light gula melaka (palm sugar, the best-tasting sugar in the world) syrup over. I served the tang yuan warm because tang yuen hardens when chilled. The durian-filled tang yuan, covered with sweet coconut flakes and gula melaka, was stunning. I hope this has not already been done before because I'm patenting this for my dessert house! I'm kidding but I think if I have a dessert house, this item will be a huge hit. If there's one thing I've gained from the Jelliriffic! Challenge, it's the obsession in creating new recipes. The mushy durian is a little bit tricky to handle but you can half-freeze it. You must make this. How good can durian get? This good. 1. Mix the flour with the water until the dough comes together. You may have to add more flour or water. Divide into 7 or 8 small portions. 2. Dust your palms, roll one portion of dough into a smooth ball, then press it into a flat circle (not too thin or the durian will seep through) and put a teaspoon of durian flesh inside. Pinch the edges together to seal and roll again into a smooth ball. Repeat until all the dough is done. Place tang yuan into fridge to firm up, about 15 minutes. 3. Bring a pot of water to boil. Take the tang yuan out from the fridge. Dust your hands again with glu rice flour, roll the tang yuan between your palms until round and smooth and drop them into the boiling water. Immediately use a pair of chopsticks or slotted spoon to move the balls so that they don't stick to the bottom of the pot. Turn the heat to medium. When the balls rise, they are done. I like to switch the fire off, cover the pot and wait a couple of minutes. 4. Scoop the balls out with a slotted spoon onto a bowl. Sprinkle coconut shavings over and drizzle with sugar syrup. Terri, Durian tasted heavenly. How I wish stay next to you. Ha.. Ha..
Wow, great idea, except I cannot make it here cos Pat does not like durians or even the smell! You want to make me green of envy with all this stuff made with Durian!! This looks really really delicious!! I really would like to taste it!! When are you coming to collect your prize in KL? YUM! I can smell the bursting deliciousness oozing from your blog! jackie: i'm sure tt you are a masterchef too:) so have you made this yet? mg: we'll have a dinner soon, after all the SPM hoohah. mary: i do need a neighbor who wants some of my experiments lol! tina: start him on durian cakes? then slowly proceed to the real thing. i think it's both the smell n the strange soft mushy texture tt puts weserners off. yi: yes we will! and we go to pets shops again yes?! vl: hey girl, thnx for your encouragement n support! 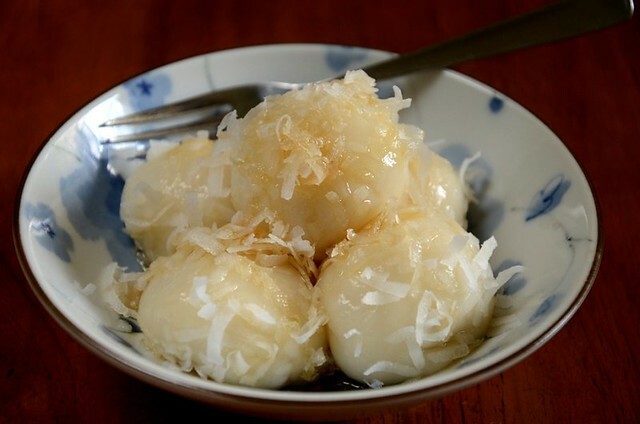 This is a combination of "mochi" n "ondeh ondeh". Brilliant!!! N thanks for the terrific recipe.